Good Stuff NW: Vive la France! It's probably something known to every fifth grader on the planet, but it was a surprise to me. The CIA, yes, our Central Intelligence Agency, has a website called the World Factbook, one that lists (nearly) every country on the planet, with their flags, history, political systems and all the stuff I used to get from an encyclopedia. Unfortunately it doesn't include the juicy stuff like which diplomat's wife is having an affair with which consul's assistant or how the Pakistanis could have missed a certain tall, bearded man living in a high-security compound in a retirement community inhabited by its own military. For that I guess we have to go to Wikileaks which, by the way, Wikipedia is quick to inform us that it is not associated with (in case you were wondering). What the CIA is missing are the sections I used to love in the encyclopedias of my youth that illuminated the way people lived in the country, their cultural traditions and the foods they loved. So I didn't find the CIA's dry recitation of facts much help in coming up with a brilliant detail about French cuisine that I could riff off of to open this post about our dinner at Cocotte, the charming French bistro that recently opened on the corner of NE 30th and Killingsworth. Originally opened as the Middle Eastern-inspired Grolla, it closed and was briefly home to Fats, Micah Camden's unfortunate venture into pub cuisine. It is one of my favorite spaces in the city, with nearly floor-to-ceiling folding wooden doors that let in the maximum amount of light for its north and east-facing site. I'm hoping the new owners have left the doors in functioning condition, since I've always thought they'd be wonderful thrown open to catch the summer breeze. Those owners, Kat Liebman and Zoe Hackett, met while both worked in the kitchen at Lucy's Table, and they've cleaned out the Brit tchotchkes and Frenchified the place with framed botanical prints, mirrors and country antiques. 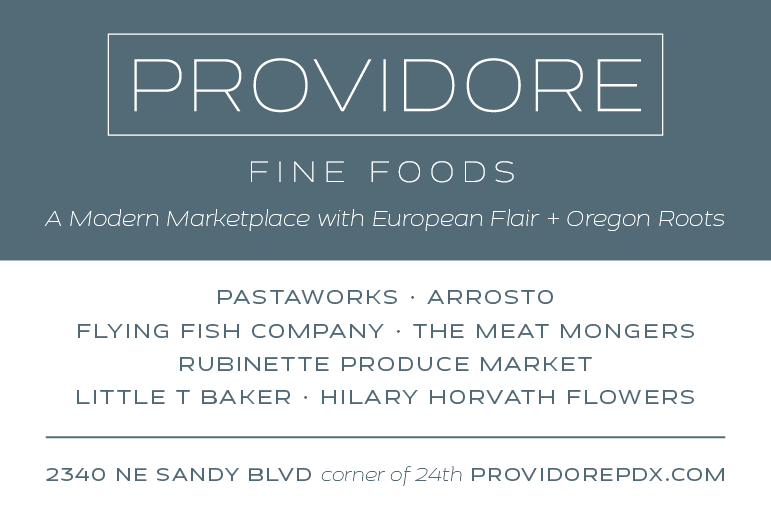 Like fellow newcomer St. Jack, the Gallic vibe spills out of the menu with dishes rooted in France and executed with Northwest ingredients like produce from Side Yard Farm, an urban farm located in the neighborhood, and meat from Eat Oregon First, a network of local farms banded together to distribute their products. 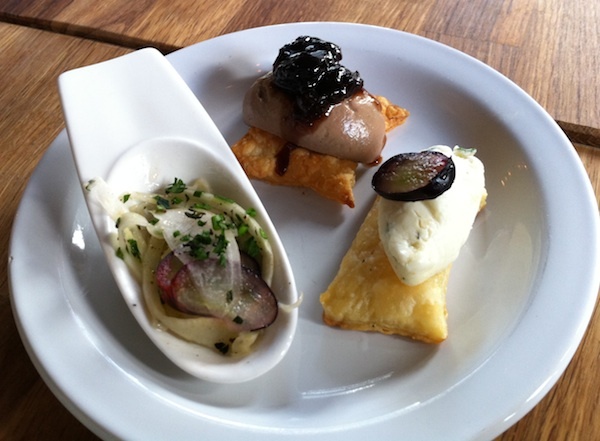 The amuses were delightful bites, one a light chicken liver mousse and the other a triple cheese mousse, both served on different delicious, crispy house-made crackers. 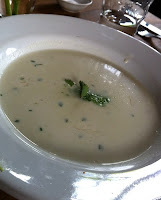 The vichysoisse soup was also light and creamy with a tiny touch of unusual pesto made from burnet, though the advertised splash of rhubarb lemon verbena vinegar, which sounded really interesting, was virtually undetectable. The duck confit was crazy good, served on a bed of farro, baby arugula and watercress and adorned with wild mushrooms, braised spring leeks and a dollop of blood orange marmalade. 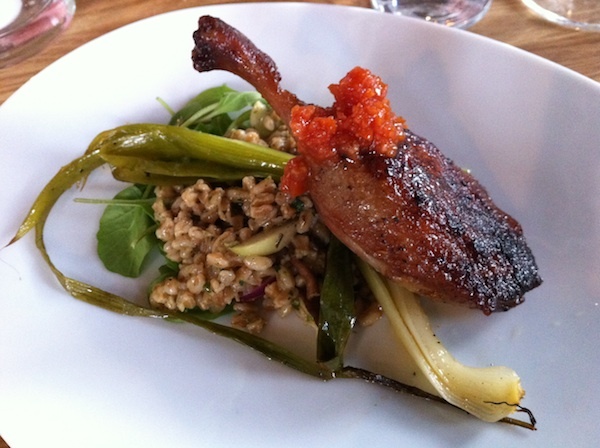 The grain and vegetables complemented the duck perfectly, and had me making a mental note to get some farro on my next trip to the store. The excellent pork loin chop had my two carnivorous companions raving, but over the mustard French lentils that were beneath it, behavior unusual for them, to say the least. 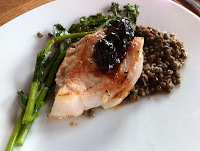 I managed a taste of the bing cherry and roasted shallot jam that topped the meat, but got a definite "stay away from my lentils" glare from both of them when I attempted to scoop some. Sheesh. 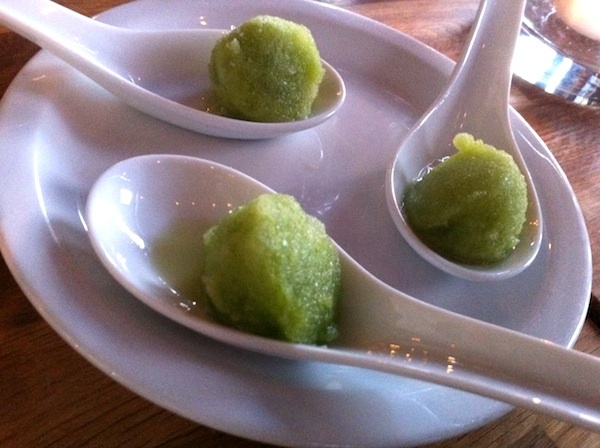 After a palate cleanser of an interesting celery and fennel sorbet, the salad of straight-from-the-garden spring greens with shaved fennel, castelvetrano olives, grapefruit sections and marcona almonds dressed with a creamy peppercorn vinaigrette was a nice combo I want to imitate at our next dinner party. 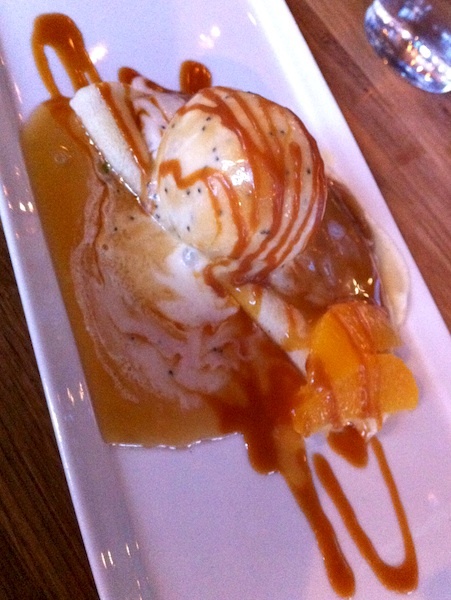 My dessert, a crêpe suzette drizzled with caramel and topped with a scoop of poppy seed ice cream, was a surprisingly light and lovely finish, but was totally upstaged by the chocolate peanut butter ice cream lusciously melting over Mr. B's choice of crême fraîche chocolate gateau. Magnifique! Dave and I chose to include the wine pairings for an additional $15 per person, which brought the $35 prix fixe price for the four courses with amuse-bouche and palate cleanser to a total of $50 each. While it's a great deal for the quality of the food and wine offered, what concerns me, of course, is whether they'll be able to draw a regular crowd to support that price tag on a regular basis. I'd frankly rather see some of the items offered à la cart, even if it's only at the bar, since the food is genuinely terrific and worth seeking out on more than a special occasion basis. The service the night we were there was stellar, and the kitchen bent over backwards to accomodate Dave's lactose intolerance, giving him a specially concocted amuse course and a dessert of broiled grapefruit glazed with caramelized sugar and marcona almonds. 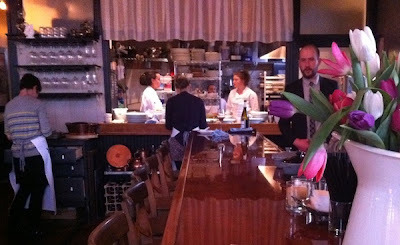 It's a lot to ask of a French restaurant without much notice, but they rose to the occasion admirably. Like Le Pichet in Seattle, this place could easily become the go-to when you need a fix for your inner Francophile, and we're anxious to return to try the happy hour when food specials are available for $5. I'm sure the CIA is uninterested, but I wonder if Julian Assange knows about this place yet? 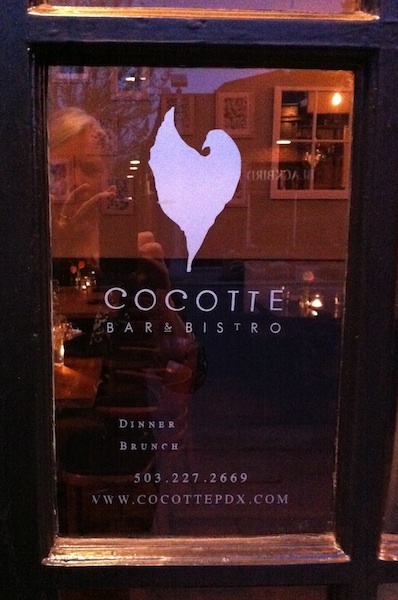 Details: Cocotte, 2930 NE Killingsworth St. 503-227-2669.